This is such an easy look for anyone to do on themselves or someone else! You don't have to use these exact products, but just look in your own collection for matches! I promise, you will prob find something that will work! You could also use yellow tones or even taupes! Just keep the eye neutral and light and add the punch with a crazy color liner! I believe I covered everything here! If I missed something you are interested in, send me a comment! I will be posting some photos soon or, you can check out the video for complete application directions! (www.youtube.com/VanitysEdge - The video is Tutorial #1!) Thanks for coming by you guys! Talk to you soon! I LOVE this new nail polish I picked up! I got it when I went to Ulta the other day and couldn't wait to get it on! The color is (730) Breakin' by China Glaze. It is a gorgeous orange color with some shimmer in it. The shimmer is not too much, just enough to add a little subtle sheen to the finished application. China Glaze makes some really great polishes and they are thick and only require two coats. This color is perfect for summer as are a number of the other colors they have been producing lately! Go to your local Ulta to pick it up at a steal for only $6.50! I don't know if they sell these online or not at www.Ulta.com. I know there are some brands of nail polish that they do not sell, but it is worth checking out, for sure! I got up this morning to go to Old Navy & grab up some of their $2 tanks for myself & my daughter...it was a bust though! But, this was not the reason for my blog! I got up a lot later than I had planned and wanted to be there when the doors opened, so I only had about 15 min to get out the door! This is obviously not enough time for the full beauty routine, so I wanted to even out my skin tone and add just a natural look in no time! This is what I came up with! By mixing Ulta's brand of tinted moisturizer (for fair to medium skin tones) and No7 High Lights Illuminating Moisturizer, I acheived an even skintone with minimal blending or effort! I mean, it looked as even as it would have using my mineralized foundation. I was pretty impressed with the way these two products worked together. When I first purchased and used Ulta's tinted moisturizer, I HATED it! It was thicker than I had wanted and ended up being a little dark for my skin. Therefore, it has been sitting on my vanity with all my other products, going unused...until today! I will probably use this routine daily...alone or with concealer & powder! So, if you are interested in this quick tip, go check out the video on YouTube! I will put the link below! This is hopefully going to be the first of many videos in my Quick Tip Section! So, I have been super pumped about MAC's SUMO SALE Online ever since I opened my first email telling me about it! I have blogged reminding people, going to the site everyday for the past week planning what I was going to get and budgeting what I would need. Of course, as always, I waited until the last minute to go to the site and finalize my order. Somewhere between entering the eighth shadow and the fourth palette...I took a step back to analyze what I was really doing. Sure, 25% off is a great deal, especially when it comes to "we never put things on sale" MAC, but looking at my collection of not only MAC but all the other brands made me realize there were things at my vanity that I haven't even opened yet! I tried to justify the purchase with many different points, the main one being the fact that I have been working on getting this freelance gig off the ground and I really need to make my kit more portable! Sure, that IS true, but right now, with the economy the way it is and the future cost of gas going up at the very least a buck a gallon, really doesn't leave much breathing room when it comes to the finances of a single mom! So, rather than place the order, I closed the site, took a deep breath (I even shed a little tear), and smiled about my own self-control. I amazed myself, considering how weak I can become when it comes to makeup. Sure, I may regret passing up this deal when I am paying full price for all those items later on, but I also know that this week all my bills will get paid and I can even take a little money and have some fun with my daughter this weekend! www.temptalia.com ~ Go Check It Out! Check out this site if you haven't already! 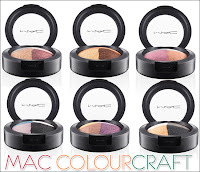 It is a killer site to see preview photos of all the upcoming & new MAC collections! You will love it! So I have been wearing this nail polish for 3 days now. We are at the halfway point of my work day and I have 3 nails that are slightly chipped at the ends. It doesn't look terrible or anything but because I am so OCD about painted nails, all I want to do is go home and take it off now! The color still looks good and I truly feel that if I hadn't been typing, packing and shipping all morning, I may not have been faced with this issue. STILL...for $2, this is a good nail polish and on a scale of 1-10, I would give it a 7. (Most of the points for the pretty color and the fact that it only required 2 coats for the nice coverage. I am going to try it with a different top coat and base coat. Maybe there will be a difference then! Let me know your thoughts!! So I have found my new fav pink polish! I picked this up at WalMart the other night when I was shopping for my daugher's birthday party stuff. I bought it sort of on a whim. I have been looking for a particular polish for weeks now, so I look at polish everywhere I go...generally ending up with one or two, not the one I was looking for! LOL! This one immediately caught my eye, which was suprising since it was on the bottom shelf! I got it for only $2!!! That was the best part! I figured I would get it home and hate the color or it would take 52 coats to get it even or something. Boy was I wrong! Now, it did take 2 good, heavy coats to look like this, but the color was extremely true to the bottle! This photo really doesn't do the color justice! There is a small amount of reflects in it so, it catches the light and makes it shine. I catch myself, especially in the sunlight, looking at it and saying telling myself how pretty of a color it is! I have only had it on for two days and I used a pretty heavy duty top coat, so I don't know about the chip factor as of yet. I will be back at work tomorrow, so that will be the true test since I have a lot of things to ship out of the warehouse! If I have any extreme issues, I will for sure let you know! I will review this polish along with others on my YouTube channel VanitysEdge, so come by for a full report on my fav polishes for now! So, I picked up Maybelline's Lash Stiletto mascara yesterday when I was out. I have heard a few people talk about this mascara on Youtube and wanted to see what the hype was all about! I am starting to get a bit upset about having to throw out high-end mascaras after 3 months when they are not all used up yet! Sometimes, I just stick them in my drawer and hold on to them for no reason! I mean, $15-$20 for a mascara, I don't use it very quick, and it just goes in the trash! I HATE NOT USING UP PRODUCT! I will scrape bottles clean, combine them, whatever I have to do to get my money's worth out of them! I have been buying various mascaras lately, searching for a drug store fav! I THINK I HAVE FOUND IT! Lash Stiletto is awesome! The brush is skinny, but has a lot of thin bristles that grab a hold of your lashes making them longer...IN JUST ONE COAT! When you pull it out of the tube, there is not a huge amount glopped on the end and it goes on smooth as silk! Now, 2 drawbacks in my opinion about this mascara...one...the formula STINKS! I mean, as in smell stinks! It will knock you down its so bad! I haven't yet pinpointed the smell but it is really bad! Even 10 minutes after application, I could still smell it...argh. Point two...it isn't very volumizing in one coat. To get the volume you want for a more dramatic effect, you really have to apply 2 or 3 coats. See...they weren't that bad! All in all, LOVE this mascara! I am going to get another one to put in my kit for sure! I will just make sure to warn my clients about the smell and maybe even add a gas mask to my kit, just in case! LOL! (okay...it really isn't that bad! I can overlook a smell for a killer product!) Go pick this one up! I only paid $7 for it at Wal-Mart! (I have seen them for less on eBay, so check that out as well!) I will be doing a full review soon on YouTube so go check that out!www.youtube.com/user/VanitysEdge - Comment - Rate - Subscribe!